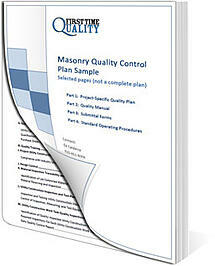 Fully-written, submittal-ready Masonry Quality Assurance Plans, Programs, & Manuals range in size between 30 pages and over 200 pages. Commercial, Residential or Government Projects for USACE/NAVFAC, FTA-DOT, FHWA, or other government agencies' standards as well as ISO 9001 and ISNetworld requirements. We'll assemble a Masonry Quality Plan, Program or Manual based on your contract specifications and personalize it with your company, project, and scopes of work information. Download a Masonry Quality Plan Sample, and see what you'll get in each section of your masonry quality plan, program or manual - Or, contact us at 410-451-8006 and we'll answer all of your questions.